Just last week the Pittsburgh Penguins were on the verge of catching the New York Rangers for the first seed in the Eastern Conference. The Penguins were two points behind the Rangers going into a game against the Ottawa Senators on Saturday March 24th. Unfortunately the game didn't turn out as we'd all hoped. The defense left rookie Goalie Thiessen out to dry as the Penguins fell to the Senators 8-4. That same night the Rangers prevailed 4-3 over the Toronto Maple Leafs in a shootout to help increase there lead for the first seed in the Eastern Conference. The Penguins went on to rebound from the 8-4 loss with a 5-2 victory over the New Jersey Devils, however dropped both games in a home and home series with the New York Islanders. The then Rangers went on a 3 game winning streak with victory's over the Wild, Jets and the lowly Canadians to increase there lead on the Penguins for the first seed. The Penguins did end up beat the Sabres 5-3, but sadly fell to the Philadelphia Flyers 6-4 yesterday in a brutal and bloody match. With only 3 games left in the regular season (Bruins, Rangers, and yes, the Flyers), it's gearing up for another Pens/Flyers playoff match-up. We all remember that in the the 2008 playoffs the Penguins defeated the Flyers in 5 games in the Conference Semi-finals. The very next year the Penguins defeated the Flyers in Conference Quarter-finals in 6 games. However the Flyers have seemed to have the Penguins number this year. In the five games this year that the the two rivals have faced off the Flyers lead the Series 4-1. 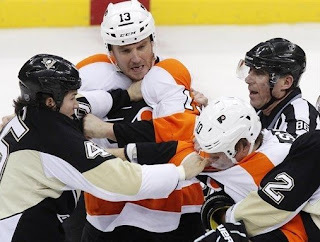 In the two aforementioned seasons the Flyers won the regular season battle in 2008, winning 5 out of 8 meetings; the Penguins won the season series battle notching 4 out of 6 meetings in the 2009. The stage is set. Both teams are healthy and have a chip on their shoulder. You and I can't seem to get our blood pressure down. Crosby, Malkin, Staal, Fleury -- Giroux, Hartnell, Jagr, Talbot. Modern day Royal Rumble.